The multilayered classification of the vineyards of Burgundy’s Côte d’Or seems positively labyrinthine compared to Beaujolais to the south. Beaujolais, Beaujolais Nouveau and the seven ‘Cru’ villages are just about it: no classification of premier and grand cru sites, and even the most renowned Beaujolais vineyards not recognised in any official way. Owned by Burgundy’s Louis Jadot, Château des Jacques is amongst Beaujolais’ leading lights, seeking to express individual terroirs and vineyards though its exceptionally fine bottlings, often compared to red Burgundy, but in fact owning little to their illustrious neighbours. I had been lucky enough to visit Château des Jacques several years ago, so it was a pleasure to be greeted again by ultra-passionate manager Guillaume de Castelnau as we touched down in Lyons airport. Guillaume lives and breathes Beaujolais, and within minutes we are deep in conversation about Beaujolais, its place in the world and what makes it special. “At the beginning of the century the crus of Beaujolais and Premier crus of Burgundy where equal, regarded as wines of the same quality and status,” he tells me. 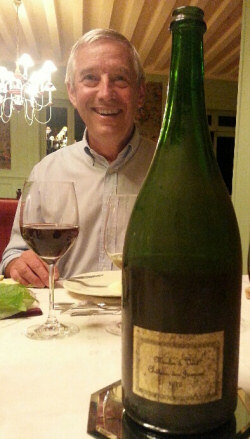 “Many people tell me my wines are Burgundian,” he continues, warming to the theme, “but I disagree: the terroir is different, the grape is different, and in many ways my winemaking is more like Bordeaux with maceration in tanks and pumping over.” Right: Guillaume with a magnum of 1976 Château des Jacques Moulin-à-Vent. The terroir of Moulin-à-Vent is indeed very different from the red Burgundy homeland of the Côte d’Or. Vineyards are planted on pink granite soils, with many sites rich in manganese. Many people think it is the manganese that makes the wines special, but Guillaume is not so sure, suggesting that manganese mines in the area left deposits that sit much deeper than the root system of the vines. Guillaume’s big project in the years since Jadot took over is in moving the vines from the old, free standing ‘goblet’ system to training along wires. “The old people basically let the vine trail along the ground,” he tells me. “The Gamay is lazy. It naturally wants to flop over, so they let it. But with grapes trailing close to the ground you cannot work the ground.” So that meant the old farmers relied too heavily on pesticides, herbicides and synthetic fertilisers to produce their crop. Farming is now much more sympathetic, with minimal use of chemicals. Though not certified, the estate uses many biodynamic and organic techniques. Guillaume makes teas from water-retaining green plants which are sprayed on to the vines to ‘teach’ them to store and use water better. He also keeps bees, and from observing them – feeding patterns, levels of aggression – says he can see when they are under a cosmic influence. “Fire, water, earth and air influences the bees behaviour,” he tells me. If the bees are behaving abnormally he has been known to halt or change the work being done in the vineyards. 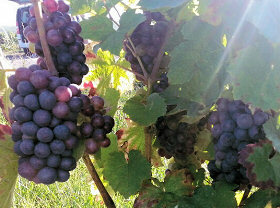 Left: Gamay in the Grand Carlequin vineyard ripens in the late summer sun. Indeed, Guillaume is one of the most thoughtful winemakers I have come across, sometimes seeming quite fretful that he is doing all he can to nurture, rather than create his wines. “When we put our wines into barrels that is the gestation period – the barrel is the egg. The shock of being taken from barrel is like birth and cutting the umbilical chord – it can cause shock, and we must take great care to protect the wine and preserve its life force, its energy,” was one quote I noted down, his earnest and passionate approach undoubtedly what elevates Château des Jacques above many estates in the area. As we visit the main winery, Guillaume walks us through the old cement tanks which are for him crucial to Château des Jacques’ quality: “It’s my favourite part of the winery: simple pigeage (punching down of the floating cap of skins) and some remontage (pumping over to break the cap) for a little more vigorous extraction of our younger vineyards. The older vineyards can go into old steel tanks for gentler extraction with only some remontage.” Guillaume has little truck with the ‘Nouveau’ style: “This is not carbonic maceration – our grapes are destemmed but not crushed, but they are so fragile that they release almost all the juice during four weeks of gentle remontage. Only around 20% is not released by this process.” Only natural yeasts are used for fermentation. One thing’s for sure, Beaujolais has had a pretty tough time of late. At the height of its popularity, the vineyard area covered 25,000 hectares, but now it is around 15,000 hectares and we passed many abandoned and weed-strewn plots as we passed through the elevated vineyards of Chiroubles. Some of the younger generation born into Beaujolais farming families have decided the work is too tough and the rewards too little to continue with their often small plots of land. Though Guillaume does not paint an entirely gloomy picture: “Often it is the poorest vineyards that have disappeared,” he says. But Château des Jacques is certainly an exception, having recently added vineyards in the Cru Fleurie to the portfolio for the first time. “The vineyards were bought during the 2011 vintage,” Guillaume tells me, “and they were not terribly well maintained bush vines. But we have been re-training them, and I think the 2013 vintage will be the first one that really reflects the Château des Jacques style.” Under Guillaume’s direction, this estate really does not seem to put a foot wrong. The quality of the vineyards sites is evident as you walk around them, and as you taste wines like the 1976 which although before Jadot’s time, is still an outstanding and complex rendition of Beaujolais. Without a doubt, Château des Jacques is a star of the South. From a single vineyard of around 10ha, which this year has suffered greatly from hail damage during a huge storm in August, so quantities of 2013 will be low. Granite soils, eight months in mostly new oak. Delicate, green-tinged colour, with some nicely greengage and vegetal aromas, a nice rounding of creamy oak and spice apple fruit. The palate has a dry, pithy cut of lemony acidity, it is a dry style, with a savoury appeal, though note a huge deal of complexity. Nice nuttiness and dry extract. 87-88/100. Much more subtle integration of oak, with a touch of clove and more mineral in character. In the mouth it has a dry, searing core of lemon, a little touch of fatter citrus and plenty of apple bite, a racy fine finish but powerful too – grippy, and I slightly prefer the youthful fruitiness of the 2011. 87/100. All of the wines in this blend come from the different Beaujolais Crus of Moulin-à-Vent. This is an entry level wine, the ‘Bourgogne Gamay’ label proving a little more difficult to have accepted in traditional markets. Very pleasing sweet fruit suggestion on the nose, cherry and raspberry aromas, a touch of chocolate, very inviting. A hint of earthiness echoes of Burgundy. On the palate it is juicy, deliciously creamy and red fruited, with a nice richness and sweetness to the fruit and soft tannin and acid structure. Delicious. 87/100. Bottled less than a month ago. Around 50% new oak for the Cuvée. Quite a delicate, light colour, and just a beautiful nose, lightly briary, sappy and ashy nuances to ripe and fresh red fruits, the tiny herbal notes are delightful. Dry on the palate, with a nice extraction of savoury tannin and very juicy fruit, plenty of spice here to, in a dry but elegantly fresh finish, the acidity bright and purposeful, giving this a savoury length and youthful, tight structure. 89/100. Deeper, bolder color than the 2012. Gorgeous nose, with gamy nuances, just the touch of blood and animal adding depth to the red fruits. The sweetness of the Gamay floods the palate, with refined, tight cherry and kirsch nuances to the fruit, but a big stripe of dry tannin and that core of acidity. Really quite dry in the finish and feels like a wine that will age very nicely as the tannins soften. 89-90/100. Again a little darker, denser in colour, with a generosity that the 2011 and 2012 do not display at this stage, with an earthy sweetness and delicious, smooth quality as it hits the palate. Gorgeous dry extract and balance, with such beautiful sweetness to the fruit, cherry into plum, with also lovely herb and spice notes and a full, balanced finish. Still dry and savoury, but with that extra ounce of generosity. 91/100. The single vineyard cuvées all see 100% new oak in 228l Burgundy barrels, for around 10 months. Quite a deep, bold crimson colour, with a fabulous nose showing more exotic, sandalwood spice, and that swirling, rich woodsmoke notes with lots of ripe, chocolate-touched berries. A bountiful wine. The palate has masses of flesh, lots of silky weight of fleshy plum fruit, ripe chocolate tannins and that double whammy of spice and cherry acidity. Long, powerful and delicious ‘real wine’. 92/100. Similar colour, perhaps a touch lighter. Briary, sappy and fresh on the nose, a touch of charcoal, that plum and tobacco, smoky note, but the fruit is drier and savoury. On the palate a powerful, to me more masculine wine, with a tighter feel, a savoury character with plenty of leafy and sappy, woodland and briar notes into the finish. Serious, dry, age-worthy. 90/100. Really dark and purple-crimson depth to the colour. The nose has real power, with a big, meaty, solid feel to this, really gamy and powerful, with plummy fruit and a feeling of more brawn and depth. The palate has a flood of deliciously sweet fruit, with fantastic substance, that big meaty core of dense fruit and supple tannin, a powerhouse that seems as if it has the Grand Cru potential with its framework and chewy seriousness. 92-93/100. Deep, rich colour and an equally rich, fruitcakey and inviting nose. Obvious ripeness and fruit richness here, marrying beautifully with some game and sappy notes. The palate is dry, deliciously savoury with great fruit – but dry and juicy. Big core of chocolate and richness, plush suggestion to the tannins, but firm, with juicy fruit, tight with the stripe of sappiness and that generous but present tannin. Delicious and long and has time ahead of it. 92/100. Fabulous nose, full of prune and ripe brambles and berries, the warm iron oxide colour suggesting richness and maturity. Then the Gamay quality really comes through, sappy, briary, gently earthy and spicy too. Delicious, mouth-filling opulence, flooded with sweet fruit, and whilst acidity is modest, somehow this does not lack freshness – it is bountiful and ripe, yes slightly raisined or stewed edges to the fruit. But so alive and so delicious. 90/100. Mature colour, and the nose has lovely fame and sweet truffle maturity too, but not at all decaying: this has a fine fruit presence, the density the almost Muscavado sugar richness is there, creamy and rich. The palate has delicious weight, texture and sweet creaminess: what a delight this is, the sappy background of those racy, savoury flavours playing beautifully against that richness and mouth-filling generosity. Delicious and a point, but again, on a plateau with no signs of ageing. 92/100. Gorgeous iron oxide and mineral nose. Delicate smokiness, tobacco and a hint of game. Fruit is cherries and a hint of plum and chocolate. Beautiful mineral tightness on the palate, with such lovely, racy juiciness. That oxide and earth minerality is still there, but just a wonderful. Full and fleshy wine yet with magical structure and freshness. 93/100. Deep in colour, a touch of tawny on the rim. Some dried fruit: desiccated fruit, cherry and rum soaked raisins, complex with some mushroom and so much fruit depth winning out on the nose. The palate has fantastic fruit sweetness. Tannins are mellow but add a little grip, but it is the acidity that is so lovely, the wine finishing with sweetness, a touch of cream and a touch of tobacco, spice and chocolate a touch of liquorice adding an edge. Superb. Hard to ascribe points to a wine like this, but what a treat. 93/100. A certain brawniness, tightness and dense appeal on the nose: suggests structure. Some lovely delicate violet and kirsch begins to emerge, a very nice lift. The palate has such a cool, linear fruit: more black fruited, some cassis, some cherry and some spice, but such a lovely suppleness too, tannins and acidity a lovely integrated support. Delicious. 90/100. Similar colour – a touch darker perhaps. Just a fraction more open, a fraction more earthy too perhaps, that tight floral character not as obvious, but more generous and open fruit along with an earthy, peppery edge. Big impact on the palate, with a decisive cherry and black, bramble fruit bittersweetness. The juiciness is delicious, keeping the freshness here through to a long, fruit-driven finish but with a spicy background of tannin. 90/100. Lovely earthiness, beginning to open and show that earthy, masculine and gamy touch, a nice hint of something vegetal too, and lovely complexity. The palate has gloriously sweet fruit, with depth, a touch of liquorice and real richness. It has delicious length, the fruit really powering through to the finish, the tannins tight and supple, lovely juicy refinement and cherry acidity a touch of leafy freshness again. 91/100. From the hillside of basalt, visible across the region with its lone tree on top. Very nice, bright crimson colour of medium density. Totally different nose: mineral and tiny iron oxide quality. Quite earthy, quite meaty, a dry fruit extract. Big, dry, savoury stuff on the palate. More sour cherry and plum skin roughness, grip, with big dry tannins. Much more of a wine for the cellar, the elegance of the fruit is hinted at, but for now it is in the grip of the tannins. 91-92/100. with potential. Slightly more dense and full coloured than the Moulin-à-Vent, with rich berries that are more primary than the MaV, gamy and spicy, rich and whilst robust, does not lack charm with the sweet and ripe fruit depth. Dry and racy on the palate, refined and dry, that savoury richness moiré structured than the Moulin a Vent, more savoury and dry, not quite as charming at this stage. 91/100. Nice colour here, a ruby/crimson hue and quite light. Light and shade on the nose too, with a little of the floral and violet perfume coming through and some spices and pepper lift, bright and juicy cherry with a touch of briar and herbs. The palate is delicious, with real juicy cherry and red plum sweetness but also the grip and tart, fresh edges of the plum skins, dry, but deliciously fresh, nicely spicy, subtle oak creaminess and that fresh acid brightness of the finish. 91/100.